The largest of all the Greek Ionian Islands, Kefalonia enjoys a number of different spellings, which include Kefallonia, Kefallinia and even Cephallonia. However you choose to spell or pronounce these variations of Kefalonia, they all mean one thing, a superb holiday destination, with a rugged inner mountain range and some quite outstanding beaches and cliffs, and even some remains of a past Roman civilisation. Kefalonia suffered much damage during a major earthquake in 1953, meaning that many parts of the island today now offer a fairly modern feel. 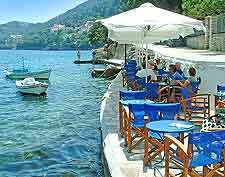 That said, the island is extremely appealing, with its stunning harbours, plentiful walking trails and popular Greek tavernas. Argostoli is the capital of Kefalonia and very much central to tourism, being home to the EOT (Greek National Tourist Information Organisation), which resides on the northern waterfront, off the Antoni Tristi and next to Argostoli Bay itself. The beaches of Kefalonia come are those that most only dream of and combined with the plentiful sunshine, provide the perfect setting for a very memorable holiday. Some of the most noteworthy beaches lies around Argostoli, such as both Lepeda and Minia. Sami is a very tourist-friendly town and just 4 km / 2.5 miles to the north-east, Antisamos Beach is an especially stunning, stony beach, backed by scenic hills. However, for the very best that Kefalonia has to offer, you will need to visit Myrtos Beach, to the south of Assos, which boasts white sands, limestone cliffs, and clear blue water. More information about Kefalonia Beaches. 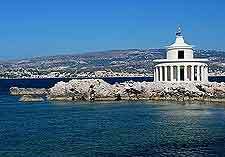 Argostoli is where a number of the most attractive Venetian attractions are situated. However, the village of Sami survived the earthquake rather better and its far more traditional in its appearance, being used extensively as a backdrop during the making of the acclaimed movie, Captain Corelli's Mandolin, which was filmed on located on Kefalonia island. Fiskardo is another enticing village and remains very much as it appeared before the earthquake, managing to escape any serious damage. 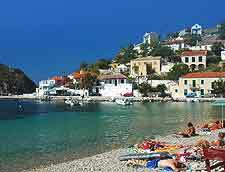 More information about Kefalonia Tourist Attractions. There are some quite intriguing landmarks scattered around Kefalonia, including some fascinating archaeological excavations at the Roman Villa in Skala, and also at the Acropolis of Sami, which dates from the 5th century BC and provides in-depth information about its past. Within the Livatho Valley, St. George Castle is another impressive structure from Roman times, with its surrounding district often referred to as the 'Kastro'. Something more natural on Kefalonia are its surprisingly large caverns, such as the Drogarai Cave and the Melissani Cave, both of which are located within Sami. Melissani Cave is particularly famous and features a vast underground lake, which is deep-blue in colour and best explored by boat. 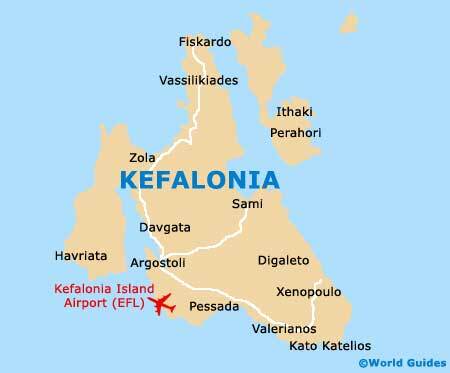 More information about Kefalonia Landmarks and Monuments. Kefalonia excellent ferry connections mean that the island is easy to reach. Regular ferries mean the Kefalonia is also highly suitable for island hopping, and many tourists choose to visit one of the neighbouring islands, for either a day trip, or longer excursion. The main island destinations connected by ferries include Corfu, Ithaca, Lefkada, Paxos and Zakynthos (Zante). Zakynthos is especially popular and just an hour away. 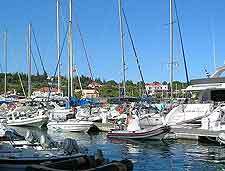 More information about Kefalonia Attractions Nearby.